3 x 2,8mm gomb alakú turbómaró keresztfogazással (YRK2106086K) 6. Ball Shape. All sizes are nominal with a 6mm shank unless other wise stated. Cut Numbers: Cut 6 - Double Cut. Crosscut and double cut to improve control and chipbreaks. Manufactured from high grade tungsten carbide for general-purpose use. Cut 9 - Chipbreaker Chipbreaker fast stock removal for improved control and reduced chips for use on hard materials, i.e. steel alloy 50RC, 60RC, carbon and cast iron. Suitable for deburring and polishing of cast iron, cast steel, carbon steel, alloy steel and stainless steel etc. up to HRC65 hardness. Please note: • Work piece and tools should always be steady and well supported. • Carbide burrs are not suitable for 'milling' large amounts of material, they are for light stock removal and high revolutions 'LOW FEED - HIGH SPEED'. 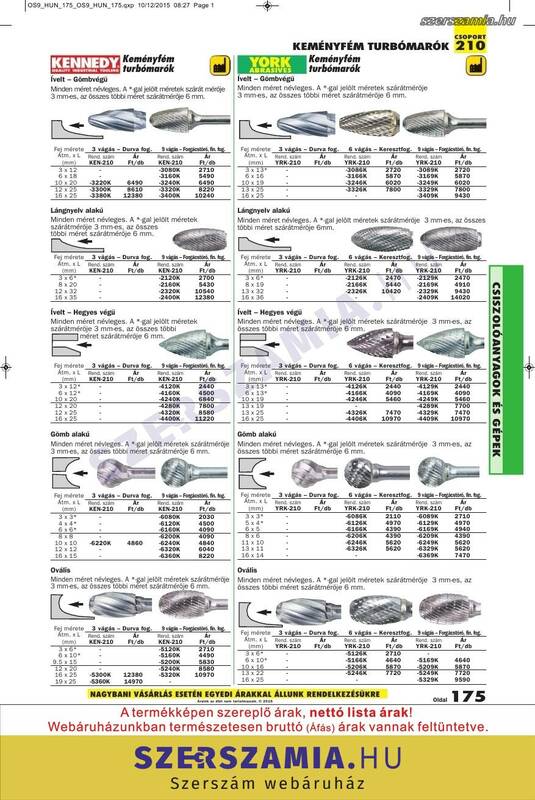 • Always ensure that at least 70% of the shank length is clamped by the collet or chuck of the tool being used. • Always ensure that the tool is rated to the recommended operating speed of the burr.